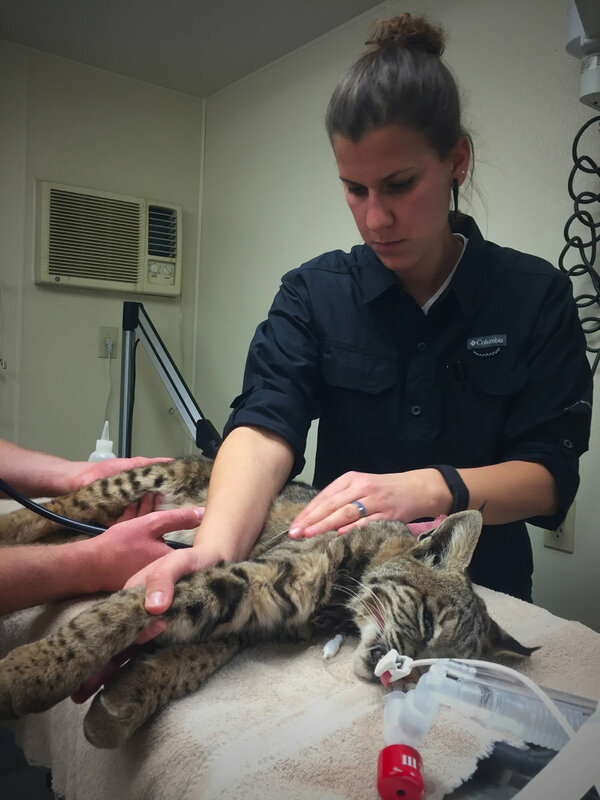 We targeted blood collected from bobcats (Lynx rufus) which were anesthetized via remote drug delivery (darting) for fitting with radio collars. Blood was collected from females and males (N=17, 24 respectively), and both juveniles and adults (N=8, 33, respectively), lyophilized for 48 hours, homogenized, and analyzed for stable isotope ratios in an elemental analyzer at the Department of Earth and Marine Sciences, UC Santa Cruz. This study revealed differential prey preference as a function of habitat quality (distance from native habitat edge) and fragmentation (native habitat size). Bobcats living on the urban fringe exhibit lower 13dC and higher 15dN blood values than those living in the core of the habitat, an indication of dietary differences. More extensive analysis of these data and its interpretation is ongoing. Stay tuned for more information! Bobcat tracks at the Irvine Ranch Conservancy, CA. Bobcat (Lynx rufus) in Southern California. Stable isotope analysis (13dC) of blood collected from free-ranging bobcats in Southern California between 2002-2013 (N=41). Colored dots are individual sampled bobcats; color intensity increases with 13dC value, from blue to yellow to red. Purple shaded areas denote urban areas (US Census Bureau, 2018). Stable isotope analysis (15dC) of blood collected from free-ranging bobcats in Southern California between 2002-2013 (N=41). Colored dots are individual sampled bobcats; color intensity increases with 15dN value, from blue to yellow to red. Purple shaded areas denote urban areas (US Census Bureau, 2018).